So here we are, the four of us waiting at the man-made Marina Island Jetty for the ferry to jettison us across the channel on to our destination – Pangkor. The pier is beautifully manicured with coconut trees lining the shores while deck chairs are neatly placed facing the island. Everyone was bubbly after Chef Juan whipped up a hearty breakfast of blueberry pancakes and huevos pericos. The energy was badly needed after we drove more than 4 hours the night before along the highway before jumping off into the back road full of patched potholes and palm oil plantations. After a solid 15 minute cruise in the belly of the ship, the familiar sight of transport hagglers and pink taxi vans greeted us. We escaped the chaos in no time to Teluk Nipah – the main beach on the other side of the island. Anjungan Beach Resort was our destination, a resort tastefully designed based on its love for everything nautical. It’s not exactly by the beach but being located at the far end of the strip cornered by the jungle provides a bit more privacy than the rest of the hotels. It’s an acceptable trade-off since it’s close to all the restaurants, meaning you won’t get overcharged for a meal, and also walking distance to one of my favorite beaches – Coral Beach. It’s not as bustling as Boracay’s White Beach or as majestic as Perhentian’s Long Beach but Coral Beach is the best that Malaysia’s West Coast has to offer. The sea glows a deep emerald green while neighboring Mentangor and Giam islands beckon not too far away. The first thing we did was to slurp on bowls of delicious noodles at Nipah Deli. Since it was just after 2:00 pm and everyone was full, the logical thing I did was to jump into a hammock, read Cheryl Strayed’s “Wild” and let the breeze send me into an evening nap. Everyone joined in and the sleep was so good, all of us slept for a solid hour before being woken up by the sound of the kids playing around the area. Although separated from Teluk Nipah by a tiny forested cape, Coral Beach is somehow overlooked by visitors who prefer to partake in water sports at the former. 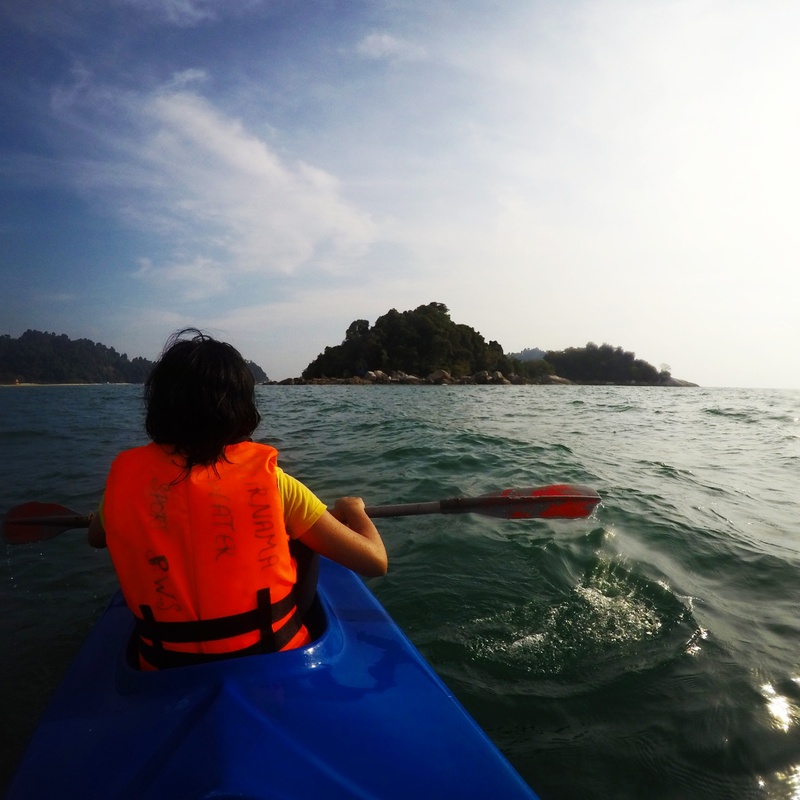 We took this opportunity to go on a sea kayaking trip to a nearby cove and neighboring Giam Island, which are also accessible via boat from the beaches. 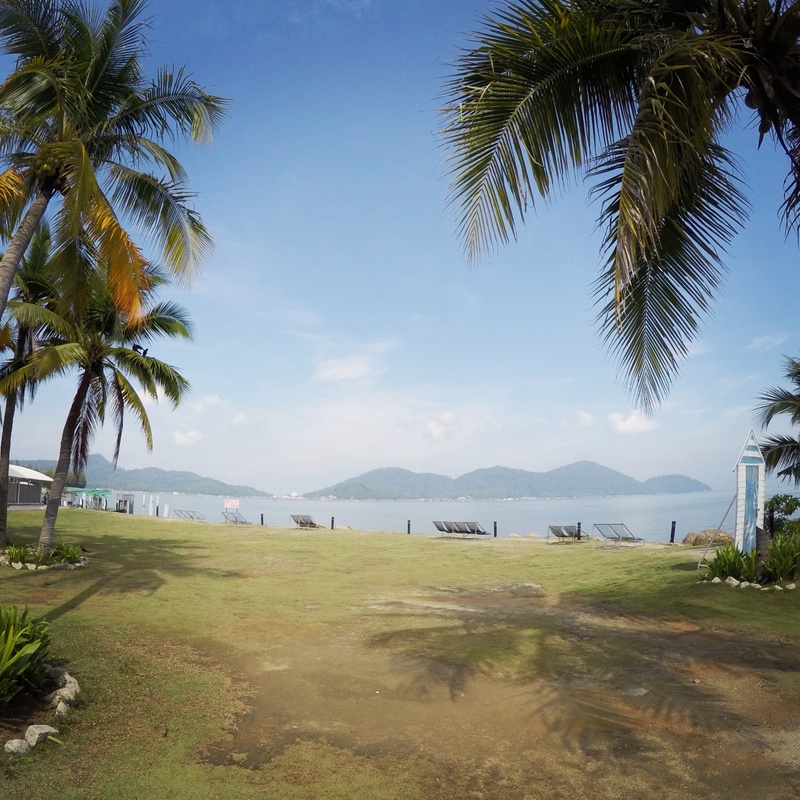 The sea wasn’t too rough so we could actually pause and enjoy Pangkor’s backdrop of long sandy beaches and hills of pristine jungle. Kayaking is something I haven’t done for a while now and it’s great to be part of the great outdoors again. It’s one of those activities where physical fitness and appreciation of nature blends well. Situated just beside Nipah Deli (can you see how much I love Coral Beach? ), Daddy’s Cafe looks like your typical beach side restaurant that serves up decent meals at a slightly higher price but looks did deceive me. Pushing aside the tacky name, they do whip up appealing meals, both to the sight and palate, at reasonable prices. 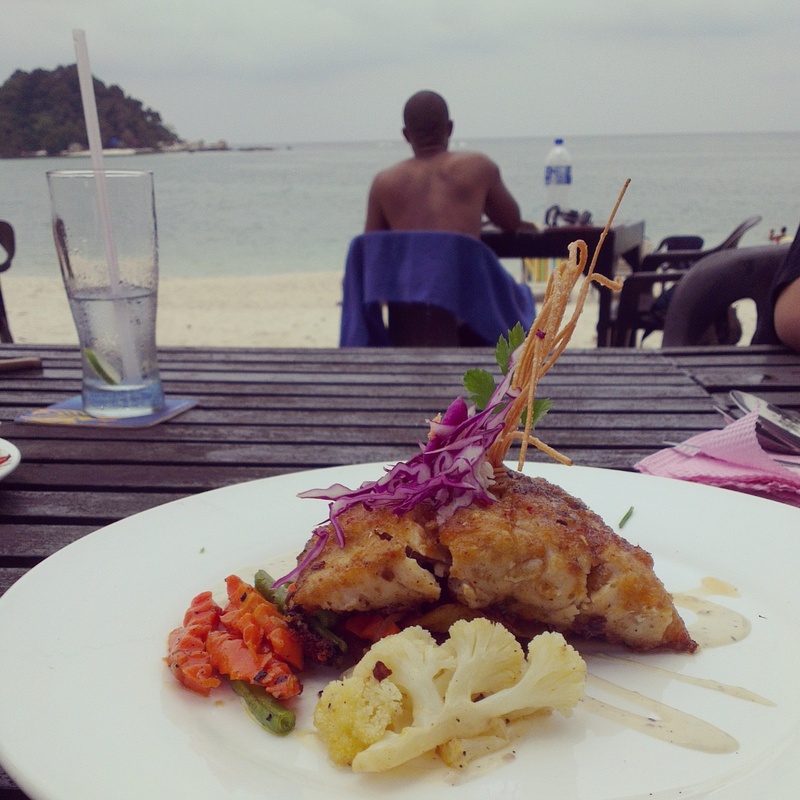 I had a Grilled Alu-Alu with Garden Vegetables [RM26.00] for lunch which was well crafted when it was served. The fish is undeniably fresh and it was topped with a small amount of sweet and sour sauce. It’s funny when you could actually order a pot of mutton curry if the seafood isn’t to your liking but if your seafood salad comes with a whole crab and octopus, it’s hard for you to say no. 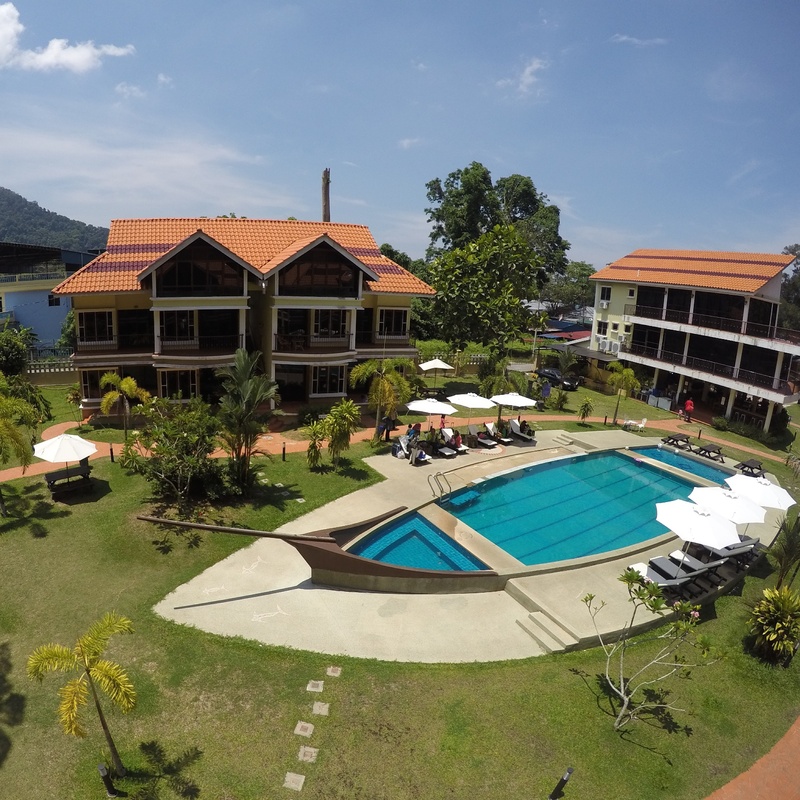 Coral Beach, and to a certain extension Pangkor Island, is not the best tropical island paradise but it makes a good destination for a quick getaway. My only gripe here is the place is regretfully littered with rubbish floating around the bay and scattered along the shorelines. 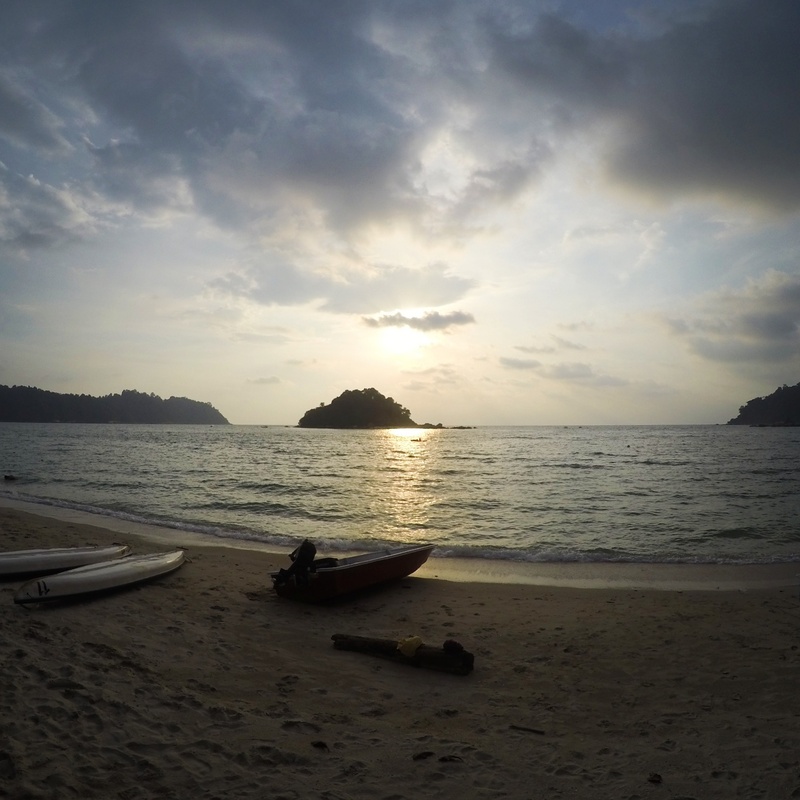 The magic of Pangkor can only last for so long if everyone do not play a part to keep the island clean from rubbish. There are some things in life that you never want to see it change and I’m being a bit selfish to say I wouldn’t want Coral Beach to ever change for as long as I live. The fastest way to Pangkor Island is by taking a ferry from Marina Island. Return tickets cost RM10 for adults and RM5 for children. The ship runs hourly and a night ferry service is also available. A taxi van ride to Teluk Nipah costs RM15 per person for 4 pax. Prices are negotiable if you come in a larger group of 6-8 and please agree on a price to go to a certain destination before boarding the cab. Water sports prices are charged at a flat rate across the board. We rented a kayak for RM20 per hour (single/double) while a banana boat costs RM20 per person for every ride.